We have a 1990 Evinrude 9.9HP 2 stroke long shaft. The motor has plenty of power to drive the boat and with a clean bottom in flat water we can make 6.3-6.5 knots at full throttle. Typically we make 5.5-6 at full throttle, 4.5 at about 3/4. The motor fits just about perfectly on the P26. 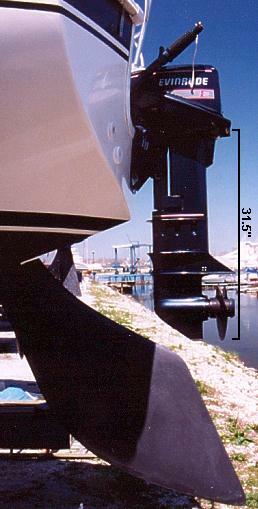 The shaft length (also called transom height) is 20". Thats the distance from the transom mount to the cavitation plate above the propeller. 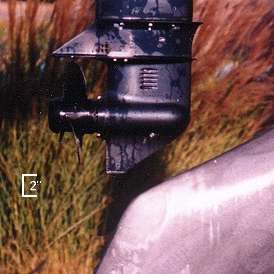 The engine clears the rudder by about 2 inches (photo). I made a measurement on the boat and motor and found the distance from the top of the transom mount to the bottom of the skeg on the motor to be 31.5". Engines with extra long 25" shaft lengths are available but I don't think they would clear the rudder. You could take a notch out of the rudder to fit the longer shaft but that may be a bit radical. We have not had a lot of trouble with the prop comming out of the water. We did at first in our choppy entrance but once we learned how to handle the boat better we were fine. It helps a lot to have some sail up, even a little. Also, as you increase speed the stern of the boat settles into the stern wave making the prop sit deeper in the water (this also increases the effective waterline length). When we're making hull speed there is about 2" of water in the engine well and the water is about 6" below the engine mount. With our 9.9 Evinrude 2 stroke we get about 1/2 gallon per hour consumption at about 5 knots, or about 10 miles per gallon. That gives us a range of 60 miles with the main tank and another 30 with our 3 gallon spare. I have a friend with a 4 stroke Honda and they use about 1/2 - 2/3 the fuel we do. If we had their engine I think we could motor 90-100 miles on the 6 gallon tank. That's a huge difference in range and if I ever re-power it will be with a 4-stroke. I think the extra cost is more then offset by the added range. Not so much because of the fuel savings, but because I see having the extra range as a safety factor. Add to that the environmental issues (I hate that oil slick the 2 stroke makes) and to me the 4 stroke is the clear winner. I would also consider an 8hp engine as I think the 9.9 is more then enough power and I have had reports from other P26 owners with 7.5's that were plenty and some who thought it was barely enough. The 8HP would likely improve the fuel consumption even more. The downside of the 8HP is, currently, no one seems to make one with electric start. But I heard from a dealer that Honda is supposed have an electric start option on the 8hp for 2001. The 8HP 4 strokes weigh about the same as the 9.9HP 2 strokes - about 75 lbs. The 9.9HP 4 strokes all weigh about 100 lbs. Honda has a new 4 stroke 9.9 (2001) that weighs about 87 pounds for the long shaft, an improvement of almost 20 lbs. I heard at the boat show there would also be a new lighter 8hp.